Contact element of triangular type. 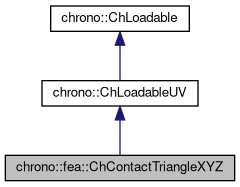 Access the FEA node to whom this is a proxy as triangle vertex. Set the FEA node to whom this is a proxy. Get the contact surface container. Set the contact surface container. Access variables for node 1. Access variables for node 2. Access variables for node 3. Tell if the object must be considered in collision detection. Express the local point in absolute frame, for the given state position. Might be needed by some SMC models. Return the pointer to the surface material. This is only for backward compatibility. Gets the number of DOFs affected by this element (position part). Gets the number of DOFs affected by this element (velocity part). Gets all the DOFs packed in a single vector (position part). Gets all the DOFs packed in a single vector (velocity part). If true, use quadrature over u,v in [0..1] range as triangle volumetric coords. Compute the jacobian(s) part(s) for this contactable item. For example, if the contactable is a ChBody, this should update the corresponding 1x6 jacobian. Evaluate N'*F , where N is some type of shape function evaluated at U,V coordinates of the surface, each ranging in 0..+1 (as IsTriangleIntegrationNeeded() is true) F is a load, N'*F is the resulting generalized load Returns also det[J] with J=[dx/du,..], that might be useful in gauss quadrature. Gets the normal to the surface at the parametric coordinate U,V. Each coordinate ranging in -1..+1. Increment the provided state of this object by the given state-delta increment. Compute: x_new = x + dw. Apply the given force at the given point and load the generalized force array. The force and its application point are specified in the global frame. Each object must set the entries in Q corresponding to its variables, starting at the specified offset. If needed, the object states must be extracted from the provided state position. Apply the force, expressed in absolute reference, applied in pos, to the coordinates of the variables. Force for example could come from a penalty model. Get the absolute speed of a local point attached to the contactable. The given point is assumed to be expressed in the local frame of this object. This function must use the provided states. Get the absolute speed of point abs_point if attached to the surface. Easy in this case because there are no rotations..
Return the coordinate system for the associated collision model. ChCollisionModel might call this to get the position of the contact model (when rigid) and sync it.